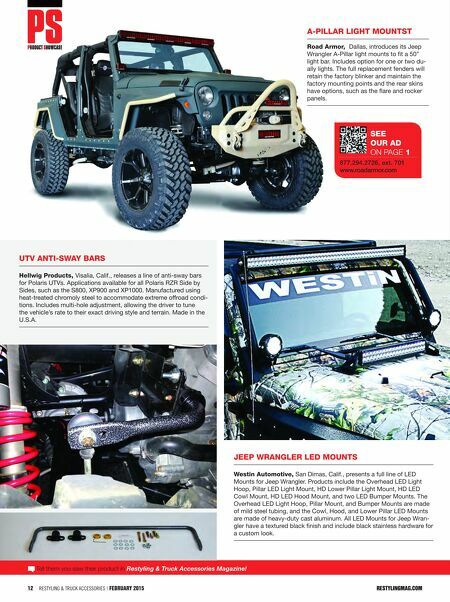 restylingmag.com FEBRUARY 2015 | Restyling & tRuck AccessoRies 13 Check out more products at restylingmag.com/product-connection PoWersteP AMP research, Tustin, Calif., showcases the PowerStep. The electric, automated running board includes a weatherproof, high-texture powder- coat finish for maximum strength and endurance. Made using high- strength, die-cast aluminum-alloy components with an anodized coated, military-spec finish to resist corrosion. 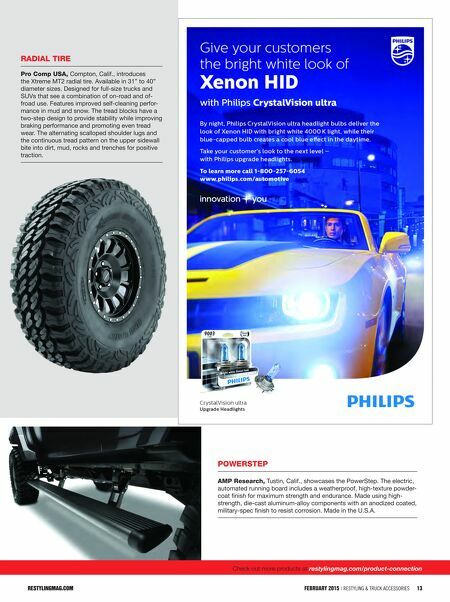 Made in the U.S.A. REstYlingmAg.com rADiAl tire Pro Comp usA, Compton, Calif., introduces the Xtreme MT2 radial tire. Available in 31" to 40" diameter sizes. Designed for full-size trucks and SUVs that see a combination of on-road and of- froad use. Features improved self-cleaning perfor- mance in mud and snow. The tread blocks have a two-step design to provide stability while improving braking performance and promoting even tread wear. The alternating scalloped shoulder lugs and the continuous tread pattern on the upper sidewall bite into dirt, mud, rocks and trenches for positive traction.